Andrew Bird, in all likelihood, has never been accused of being a romantic. Historically, his lyrics aren't concerned with the complexities that arise in an authentic consideration of love and the passions that attend it: gripping heartache, lacerating jealousy, the chest-cavity-crunching sensation of finding temporary yet ecstatic oneness in another person's flesh. In this way, he has distinguished himself from other conspicuously literate gypsy-folk songwriters of a similar stripe; while they're usually preoccupied with the lyrical potential of these passions stretched out and given symbolic form, he's preoccupied with a more esoteric iconography of artifacts, landscapes, and interpersonal concepts. If there is a love he can be accused of indulging in, it is a love of language. In "The Naming of Things" from 2005's The Mysterious Production of Eggs, he sings, "Memories, like mohair sweaters / Stretched and pilled faux distressed letters", a line that, not uncharacteristically, bears more phonetic value than actual narrative heft. That nearly ubiquitous and perhaps outmoded romantic epithet that pervades so much of pop music -- "baby" -- would seem misplaced in much of Bird's catalogue. It's too direct, rudimentary, without enough nuance to give him the space to explore. Yet this shifts in Are You Serious, Bird's first collection of original pop material since 2012's Hands of Glory. Here, with his marriage pressing on the frontlines of his memory, love rises to the surface of his lyrical repertoire, assuming a significance it has yet to achieve in his discography. However, love -- as a concept, as a theme -- is still modulated through Bird's particular brand of cryptographic wordplay and ironic self-expression. In "Left Handed Kisses", a melodically resplendent indie-folk duet with Fiona Apple, he seems to surprise himself with the affections stirring his blood into a beltway of furies: "Now you got me writing love songs," he tells his lover, "With a common refrain like this one here / Ba-a-a-a-a-a-by", and it's this punctuating "Baby", a mélange of shattered glass reassembling itself in his mouth, that becomes the centerpiece of the album. It's a word attenuated and drawn out to such a degree that you can hear Bird realize, in the middle of the quavering pitch-and-fall of the first syllable, that he's using a platitude that would never appear in a song like "The Naming of Things" or "Fake Palindromes". Yet he doesn't resist it. In fact, he lets it work him to the bone: the reverberations of this "Baby", and the passions that pulled it out involuntarily through his throat, can be detected in the track's carried-away-with-itself guitar strumming and tremulous violin accompaniment, even in the voice of Apple's distrustful interlocutor. Indeed, it's a track irrefutably about love and love's complications and, although Bird is accustomed to more arcane stylings, his unique flavor of hyper-poeticized lyricism ("Drifting gently through the gyre / Of the great Sargasso sea") works to further magnify his protagonist's conflicted infatuation with the "baby" standing across from him. But what do we make of this shift? By abruptly pivoting to an overt amorism that he's always skirted before, does Bird not commit some form of hypocrisy? Or, put another way, should we pose the question that gives the album its title? That is, do we ask him outright: are you serious? These are all questions that Bird seems to anticipate and direct towards himself throughout the course of the LP. For instance, in the rootsy power-folk stomper "Valleys of the Young", he interrogates the inevitability of love's progression from dyad-to-family-to-death, its insistence that you must retreat from the world as such, build a new world exclusively around the loved one, and then, finally, around the children you "bring into this world" with the loved one. "Still our hearts are constantly breaking / From their cradle to our grave," he sings, remarking on the inescapable pressures exerted on a relationship once a child enters the picture. But then he points a question, not at the decision to have a child, but at this relationship itself. "Is it selfish, or is it brave," he asks, caught between the indulgent egoism of love, on the one hand, and its empowering selflessness on the other. But then he answers himself with a wordless affirmation of both of these symptoms and, likewise, their irresolvable entanglement with one another: "Na na na na na na na," he stammers, then falls back into a swell of electric guitar, drum thwacks, and shimmering choral figures that all, together, embody the very inevitability of love's demands that he just interrogated and that, by extension, all give a new sonic form to the "Ba-a-a-a-a-a-by" in "Left Handed Kisses", a form that although not linguistically legible in the same way, still means exactly the same thing. 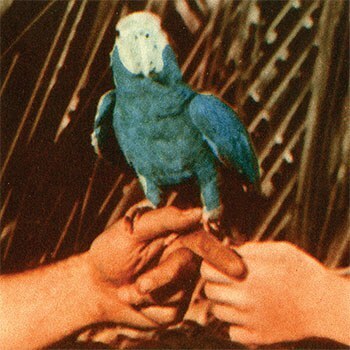 Propulsive, sincere, and lyrically opaque enough to still be a distinctly Birdian composition, "Valleys of the Young" is a highlight on an album of many highlights. To be sure, those who are already Bird fans will find no reason to complain here. "Saint Preservus" sounds so familiar that you may suspect that you've heard it before. It's overrun with almost every trick up Bird's sleeve: ponderous whistling, nimble guitar plucking, and a melody so agile and sinuously evocative that it nears timelessness. "Roma Fade", similarly, could compete with the best of Bird's back catalogue. The weaving, carnivalesque violin motif that anchors it seems to enact the "rearrangement of molecules" that its lyric describes as love's byproduct. In fact, this description -- love's byproduct -- could be applied to Are You Serious as a whole, for it's an album that's just as much indebted to love as a symptom as it is interested in it as a phenomenon.